The Bradley men’s golf team totaled 588 at the Ryman Hospitality Intercollegiate placing sixth. USC Upstate finished first in the competition with a combined score of 573. Braves junior Charles Jahn tied for third individually, hitting a 1-under-par 141. He opened Monday with a 3-under-par 68, the best round for the day. The Bradley women’s golf team tied with Illinois State for fifth at the Jan Weaver Invite and totaled 914. Junior Taylor Ledwein led the Braves with an 11-over-par 224 performance. Bradley women’s basketball freshman guard Ellie Spelhaug announced this week that she is transferring to Iowa State to join the Cyclones’ softball team next year. Spelhaug averaged 2.8 points and 2.4 rebounds per game for the Braves this season. 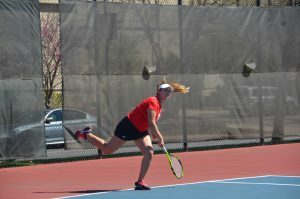 On Thursday, Victoria Sanchez Bronzetti signed her National Letter of Intent to play tennis at Bradley. Sanchez Bronzetti’s father is Emilio Sanchez Vicario, a silver medalist in Men’s Doubles at the 1988 Olympic Games and multiple grand slam champion. She is also the niece of Arantxa Sanchez Vicario, a former World Tennis Association ranked World No. 1.